We love hearing about all the ways our users explore the outdoors using ViewRanger – from walking and riding to climbing and skiing! We recently heard from Tristan Bawn, who told us about his plan to use ViewRanger’s Buddy Beacon for his stand up paddle boarding (SUP) challenge. 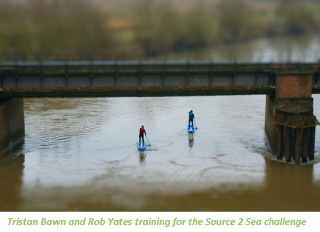 On the 20th April, Tristan and three of his friends are embarking on the Source 2 Sea challenge – a 200 mile SUP adventure along the length of the River Severn, raising money for four charities: Severn Area Rescue Association, Parkinson’s UK, Macmillan Cancer Support and Cancer Research UK. “I have been surfing for 10 years, so SUP was a natural progression for me. SUP boards are a lot bigger than a surf board, so they are much better for exploration and adventures. As a sport, SUP is pretty easy to learn – I only started last summer, and have been training for the Source 2 Sea challenge for the last five months. “Our training sessions are a good time to really get some miles in and also experience how to deal with adverse weather conditions. It is also a good time to test out our clothing, watertight bags and ViewRanger. “We have been using ViewRanger’s sports computer to get a better idea of the speed we travel at, and have been practicing tracking routes and using Buddy Beacon, ready for the main event in April. We will be posting our Buddy Beacon details on our Facebook page so our supporters can see our progress down the river, hopefully encouraging donations to our worthy causes! “The challenge we are planning to do, relative to the sport, is quite tough. We will have to contend with everything from high tides and over-hanging trees to shallow areas and white water. We’re aiming to cover around 22 miles a day, over 9 days. Our training over the weekends has shown us it is incredibly tiring on the feet as well as the arms and it is quite easy to pick up cramp. “On one of our recent training sessions we even bumped into a grey seal – 40 miles inland! It started off playing with the leash on my board and then came to say hello around the front of the board. 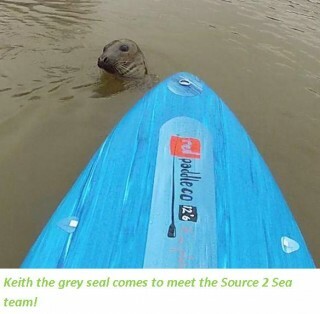 The seal – Keith to the locals – was fascinated by us and the boards so we managed to get some great footage. It was a bit of a worry at first as our boards are inflatable and with a mouth full of sharp teeth the encounter could have been a disaster! Luckily Keith was just interested in what we were doing, and even had a swim alongside us for a while. “For us the Source 2 Sea challenge is a fantastic adventure which through ViewRanger we are able to share with other people. We want to record, highlight and promote the importance of the River Severn and the wildlife we see along the way. Most people don’t realise how accessible our waterways are – with the right licence and permissions of course – but this is something we can demonstrate on our journey”. It is fantastic to see ViewRanger being used in so many different ways, with so many different sports. If you have been inspired to use ViewRanger’s Buddy Beacon for an exciting adventure coming up, please share it with us on our Facebook page or tweet us. 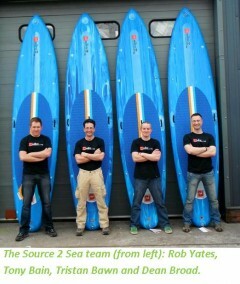 If you want to find out more about the Source 2 Sea SUP challenge then click here.